What is dark matter, and where is it? For many years, physicists have been exploring the very concept of dark matter, an invisible mass that is extremely important to our universe. 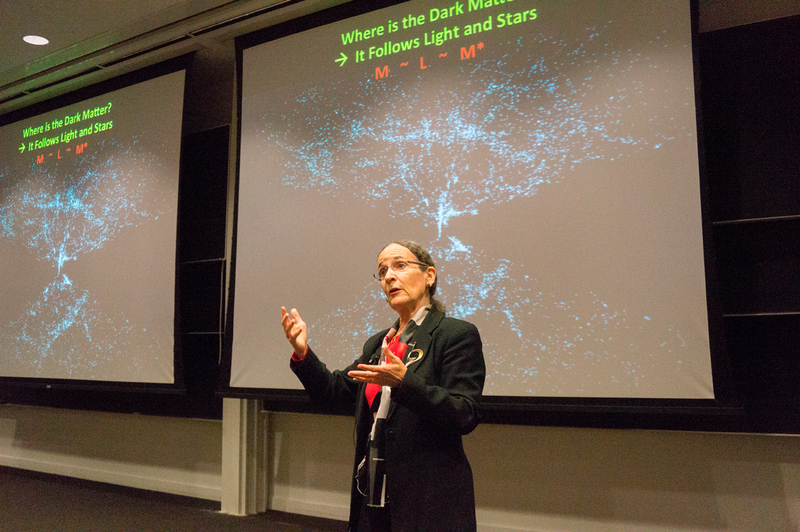 On Tuesday, Nov. 11, Neta Bahcall, renowned astrophysicist and the Eugene Higgins Professor of Astrophysics at Princeton University, came to Carnegie Mellon to speak at the third annual Bennett-McWilliams Lecture in Cosmology. Introducing dark matter and its effect as “one of the most fundamental questions in cosmology and physics today,” she then posed the question of how dark matter relates to what we can see through the telescope — in other words, how dark matter relates to visible stars and the light they emit. To offer a comparison, Bahcall first showed how darkness and light are distributed on our planet. However, she emphasized, what we have in the universe is not like what we observe on Earth. It is thus a vital task to study the effect and the distribution of dark matter in our universe. We know there is a lot of dark matter existing in clusters of galaxies, which is evidenced by the gravitational lensing of distant galaxies — the phenomenon through which the presence of dark matter warps light and causes multiple images to be captured by modern telescopes. But how exactly do we estimate the relevant data of dark matter? A classical measure is to use the comparison of distribution of mass and light, known as the mass-to-light function. Think of the following scheme: There are planes flying in the night sky. We cannot determine what the total mass of the planes is in the sky because we cannot see them. But once we can measure the light each plane emits, and once we know what one plane weighs, we can find out the mass density per unit light, which further gives us an idea of the mass of the “dark” planes. Similarly, the mass-to-light function tells us the ratio between mass and light for galaxy systems. This method yields the result that, assuming our sun has a ratio of one solar mass per solar luminosity, then our universe has a value 300 times as large. That suggests the presence of a huge amount of dark matter. Additionally, if we plot the function of mass-to-light with respect to the scale size, we would find that the mass-to-light ratio increases as we go to larger and larger scales: galaxies, groups, clusters, etc. Clearly, when we go to a larger scale, we will have much more mass and much more light. But the fact that the ratio grows reveals that as we go from, say galaxies to groups, we have much more matter than light. Nevertheless, it was noted that we do not expect such a ratio would go on increasing forever; actually, the matter-to-light value flattens on very large scales. “We do not have more and more dark matter as we go to larger and larger scales,” Bahcall said. This flattening out means that mass and light trace each other very well: Mass and light “know” where the other is. The method of studying gravitational lensing, according to Bahcall, is so far “the best way to determine mass directly, on any given scale.” Recent relevant research again confirms that, beyond some hundreds of kilo-parsecs, mass and light trace each other very well, making the function flatten. Since this measurement is really the average of hundreds of thousands of systems in the universe, it is believed to be quite a good estimation. Thus, we are able to find the mass-to-light ratio and get the mass density in our universe. The final result turns out to be 25 percent of the critical density, a hypothetical value at which the expansion of the universe would cease. Such a result is found to be consistent with many observations made so far. Further, the result also indicates that most of the dark matter seemed to be contained in the haloes around individual galaxies. The mass of such haloes dominates the total mass. Even though the dark matter halo cannot be observed directly, its existence can be deduced from its gravitational influence on the stars and gases in galaxies. When all this information is combined, dividing the mass-to-light value by the fixed stellar-mass-to-light value tells us that, in reality, the stellar mass only accounts for one percent of the total mass in our universe. Such a value is approximately valid for all scales above 300 kiloparsecs, in essence because of how gas and stars were formed in the early stage of our universe. So what do we have now? Bahcall concluded the lecture by using the image of darkness and light on Earth, which she showed at the beginning of her lecture, again. Unlike the case on Earth, where the dark places are solid continents, in the universe, “wherever we see the light, that is where the dark matter is distributed,” Bahcall said. In other words, mass and light follow each other perfectly. This information of dark matter distribution tells us, as Bahcall put it, “quite an amount of information” — not only the nature of dark matter, but more importantly, how they are put together to form the whole skeleton of the great universe as we know it.